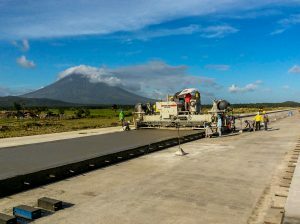 Power Pavers customer SunWest Construction Development Corporation is paving a runway, taxiways, and aprons for the new Bicol International Airport in the Philippines. The P4.7 billion (105-million USD) project underway in the Daraga municipality of Albay province in the Bicol Region has been in the works since 2006 as a replacement to the Legazpi airport. The single-runway Legazpi airport is in an area where future expansion is not possible. In addition, the existing facility is also hampered by activity at the nearby Mayon Volcano, which often disrupts flights. 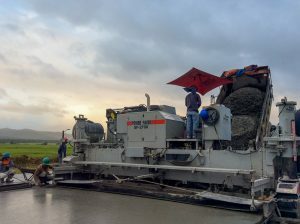 SunWest used their Power Paver SF-2700 to pave a total width of 45 meters (147.6 ft) for the new Bicol runway. The SF-2700 was set at a width of 6 m (19.7 ft) and the runway was paved in 6 lanes. They then changed the paver width to 4.5 m (14.8 ft) and added the shoulder onto each side of the runway. A belt finisher was used on the back of the SF-2700 to produce a smooth finished product. The runway is 2,100 m (6,889.8 ft) long and 40 cm (1.3 ft) deep, and tool 37,800 cubic meters (49,440.5 cubic yards) of concrete to pour. 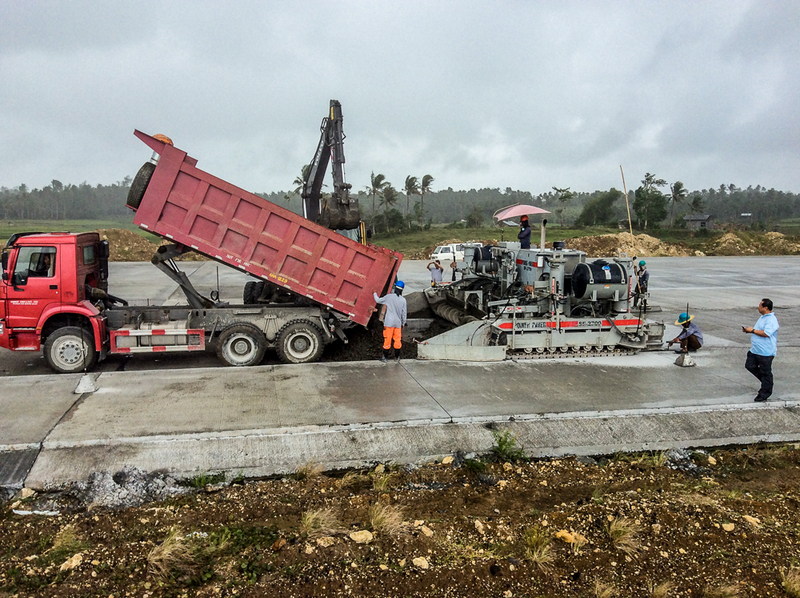 The mix design for the runway paving included sand from the Mayon Volcano, 2- and 4-inch river stone, and 3/8″, 3/4″, and 1″ crushed stone with a 1>1.5″ (25>40 mm) slump. The new airport is expected to provide a safer and more economical way to reach both domestic and international destinations from the region, which is made up of six provinces and has a population of 5.8 million people. It will be able to accommodate larger aircraft and more passengers, and has room for long-term growth and expansion. The Bicol International Airport project will include a 2-story 143,375 square foot (13,320 m2) passenger terminal as well as an administration building, cargo terminal, and maintenance and utility buildings. It is scheduled to be fully operational by August 2018 and could see as many as 8 million tourists each year.